This Puerto Banus Premium apartment, located in an apartment complex, offers modern & original decoration. The apartment complex includes a large outdoor swimming pool and children's area. Covered parking at a cost of 11€ per day and others with an extra cost (breakfast buffet 9€ & meals, tennis courts, golf). One of our brand new apartments Marbella, completely renovated. We really enjoyed our stay in Marbella. The apartment was excellent everthing was in! We will recommend habitat too our friends and family. A 22.00% of total price is charged on your credit card for all reservations. The apartment Puerto Banús Premium is located in Puerto Banús area. The apartments complex is located in Avenida Rotary at just few meters from the marina and Puerto Banus beaches. The area offers fashion shops, bars, restaurants besides nice walking areas. 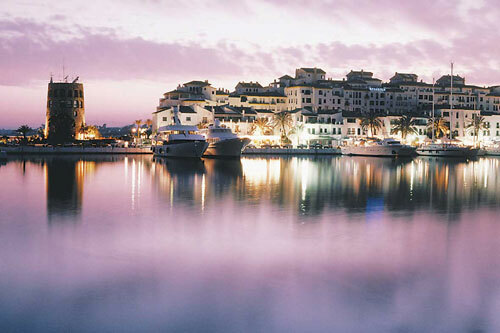 Puerto Banús, a luxurious sport port located between the sea and the mountain and an emblematic image of Marbella, the municipal it belongs to. Since the 1970s, when the port was inaugurated, it has been frequented by the 'jet set' and today is an important port, he most famous in southern Europe, for sports and tourism. The port offers a variety of leisure activities, culture sport. The impressive colours and climate of this area, have helped increase the popularity of this area and, of course, golf. The Costa del Sol, also known as the Golf Coast, offers fifteen golf course of high level and infrastructural quality. Perfect for those searching for sun, sea, beaches, fun, nature, excellent cuisine and sport, you'll find all of this in Puerto Banús. We really enjoyed our stay in Marbella and the apartment was perfect for our needs. If we return to your city we would definitely book this apartment again. i would have noreaervations about recommending these apts to my family and friends.